A country road zigged and zagged its way through the copper-colored tobacco farms spread across the Viñales Valley in western Cuba. We stopped at a little roadside tobacco factory about a mile out of town called a despalillo de tabaco where they sort the tobacco leaves according to quality and color before sending them on to the Francisco Donatien factory in Pinar del Rio. We walked out into the fields where turkeys and chickens were pecking at the red soil, searching for the pests that eat little holes in the silky-smooth green leaves. 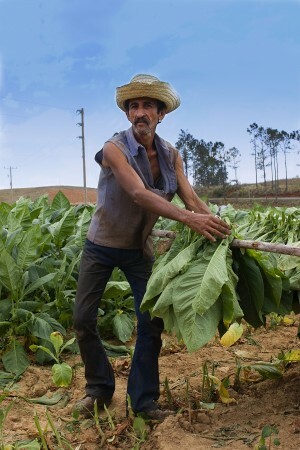 There was a veguero or tobacco farmer in the fields looking slightly malnourished and no doubt older than his actual age. He wore a filthy armless shirt that looked to be homemade and a straw hat, too small for his head, that reminded me of something a child would wear. He had a small white knife with a curved blade—almost like an oyster knife—that he used to quickly slice off the criollo leaves, hanging them over his arm until he had a bunch large enough to drape over poles in the field for drying. This was the ligero tobacco, the best and most aromatic of the leaves that have received the most sun. He showed us how to use the knife. Although the harvesting looked simple, there was a trick to it, as there is to any age-old expertise, that we couldn’t quite master. In any case, you could see how the harvesting of the leaves was a delicate process that would also wear a man out after a few hours, particularly in this steamy heat. 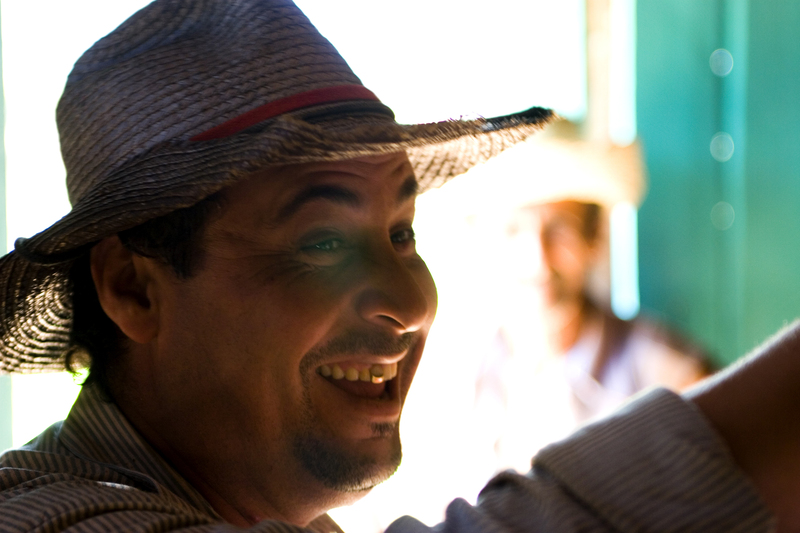 There was another veguero working in the drying shed, a cheerful young man with a gold-capped front tooth. It looked like the man had lost the tooth, since the gum-line above it was damaged, and it had been stuck back in his mouth and then, perhaps where it had partially broken off, capped with the gold. When we told him we were mostly American, he shook our hands and told us that a few years back he’d tried escaping on a boat to Florida but had been caught and ended up spending 17 months in a Cuban prison. Although he smiled, he spoke with a simmering anger just beneath the surface and you had the feeling that he’d try to escape again if the opportunity arose. Like just about everyone we’ve met in Cuba, the vegueros were extraordinarily friendly to us, happy to have their photo taken or tell us, in Spanish, about their lives in a way that never seemed intended to elicit our sympathy. Still, you couldn’t help but feel empathetic. Their lives are as difficult as that of a farmsteader working a dry plot of land in the Dakotas a hundred years ago. Except that the Dakota farmer could always give up the land and try to make a go of it somewhere else or move to the city and become a shoe salesman. These vegueros can’t. Like their fathers and their father’s fathers, they were born on the land to work the tobacco fields and will most likely die on the land. So you feel extraordinarily sad that someone like our gold-toothed friend hadn’t made it to Florida, but then again you think, What would have happened if he had? An uneducated grown man who speaks no English and has done nothing but grow tobacco his whole life suddenly showing up on the shores of Miami? To do what? Still, listening to his story, you couldn’t help but believe that he, like all Cubans, should at least be given the opportunity to try out a different life, if that’s what they want. His name is Victor and he is 52. 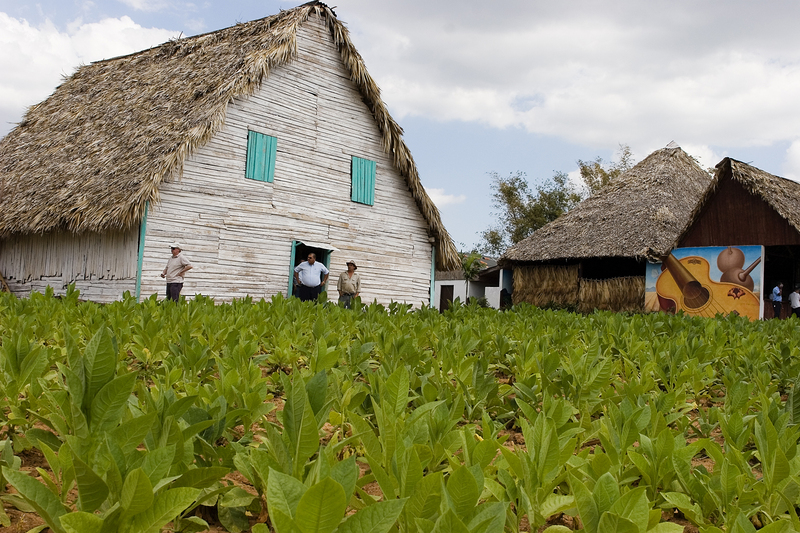 This is a very touristy spot where they take many organized groups on excursions so they can see how tobacco is made. I am guessing you were one of those, weren’t you ?